Soulful originality is, of course, a defining attribute of this Son of Seattle, the great bassist/composer Evan Flory-Barnes, and he brings that and much more to his latest project, “On Loving the Muse and Family,” presented March 1 through 4 at On the Boards. Based on the model of late-night variety shows used by Nat King Cole and Dean Martin, Flory-Barnes uses this format to delve into the relationships—both familial and otherwise—that have shaped his life and career. Fittingly, the performance features an extended family of Seattle musicians, including The True Loves, the Seattle Girls Choir, and The Traumatics, as well as a full orchestra. Also featuring self-reflexive monologue songs, and with a musical range encompassing soul, country western, and ensemble choir, “On Loving the Muse and Family” is a celebration of life, philosophy, and psychology through music—an intimate evening with a cast of characters, both real and imagined, that reveals the artist’s inner relational and emotional world. A graduate of Garfield High School, Evan Flory-Barnes has been performing and composing music with a wide variety of artists, in Seattle and beyond, over the course of his career. 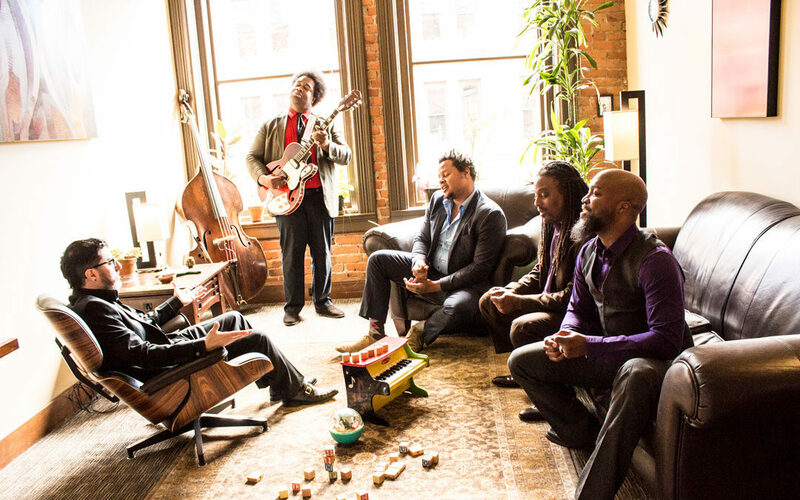 Perhaps best-known as a member of the genre-defying Seattle supergroup Industrial Revelation (Ahamefule J. Oluo, trumpet; Josh Rawlings, keys; D’Vonne Lewis, drums), Flory-Barnes remains an active collaborator in the Northwest music scene. He is well-versed in a variety of genres across the musical spectrum, including classical and free improvisation to hip-hop and hard-bop, and brings a demonstrative passion, joy, presence, virtuosity, and spirituality to every endeavor—and this performance will be no exception. Tickets are $23 in advance, $30 week of the show, and are available at ontheboards.org. Thursday, March 1 – Studio Supper with Tarik Abdullah: Family-style, pre-opening night dinner. Pay-what-you-can sliding scale; attendees must have a ticket to the evening’s performance. Reservations must be made in advance – info@ontheboards.org. Saturday, March 3 – WTFJH? Saturdays: Lobby and FUBAR will be open for audience members to connect and talk about the performance. Sunday, March 4 – Childcare Available: Childcare is available during Sunday performances for kids age 2-10. Must reserve in advance. More info at ontheboards.org.